Ah, Paris. The city of love, lights… and coffee. The traditional pastime of sitting at a cafe for hours and indulging in a cup of brewed coffee with pastry treats is something that the French do best. Over here in Singapore, we love our coffee just as much, whether we’re chilling at the newest cafe or grabbing our morning kopi. With the festive season fast approaching, it’s time to start catching up with your friends and families. Instead of breaking out the booze, you might decide to catch up over coffee. You can easily make a delicious cup of coffee right here in the comforts of your own home, and impress your loved ones while you’re at it too! All you need is a Nespresso machine, a couple of capsules, and you’re good to go. For this year’s Festive Collection, Nespresso is shining the spotlight on Parisian Gourmandise by combining the elegance of Paris together with the quintessential French coffee culture. The collection sees three new limited edition capsules inspired by the indulgent flavours of Parisian Patisseries, as well as chic coffee accessories to really revel in the whole Parisian lifestyle. After all, good coffee is meant to be savoured and enjoyed in style! Just like the macaron pastry that it was inspired by, the Variations Paris Macaron is sweet and subtle. Using a Livanto and almond blend, this espresso is slightly nutty but not too bitter. The Variation Paris Macaron is an easy coffee to drink, and will even impress those who don’t particularly care for coffee. Another one for the sweet-tooths – the Variations Paris Praliné pairs the Livanto base with notes of hazelnut and caramel, reminiscent of the French pastry. Nespresso rates this Variation as a 6 on their intensity scale, making it a moderately bitter and roasted coffee. A much more intense shot, the Paris Black is a strong blend of Arabica and Robusta coffee, with sweet and spicy notes. If you enjoy your coffee strong and bitter, here’s your go-to. Un café just like how the Parisians like it. The Nespresso capsules are recommended to be enjoyed as an espresso, but you can also pair them with milk to create indulgent cappuccinos or get creative and experiment with different coffee recipes – get some inspirations here. Now that you’ve got the selection of coffee down, there’s still the question of serving it to your guests. Great coffee is better enjoyed in style – which means that your coffee cups should be stylish too. Also launching soon as part of Nespresso’s Festive Collection are these two gorgeous cups designed by India Mahdavi. Because it’s all about the coffee, Mahdavi draws inspiration from the coffee bean for a rounded matte cup that screams luxury. 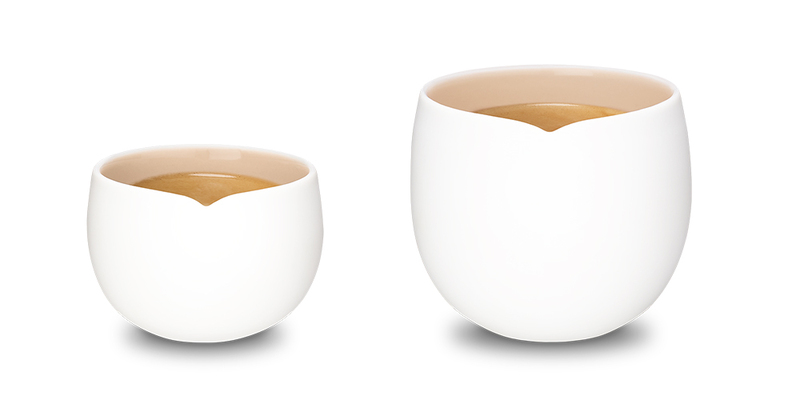 The cups will fit snugly into the palms of your hands as you nurse a freshly brewed cuppa. And it goes without saying that the eggshell-smooth cup is a perfect Insta-prop – you’re really covering all the bases here! We also haven’t forgotten about the whole gifting spirit of this festive season. If you’re still looking for a gift for your coffee-loving friend, you’d might want to gift him a handy coffee machine which conveniently churns out coffee from little capsules. You can still enjoy good coffee without the mess of grinding your own beans. Nespresso is running a festive promotion where you can get up to 20% off selected coffee machines! Inissia is one of their best-sellers – a compact coffee machine good enough for Espressos and Lungos. If a home café is what you’re after – consider investing in a Creatista Plus for some latte art fun. Head over to Nespresso.com to check out all the machines they have – there’s one for every coffee aficionado! If your friend already has good ol’ trusty coffee machine, you can consider gifting them a capsule hamper or a nice tumbler. Our friends over at Nespresso have put together a gifting guide for some inspiration. Strive for the best friend award of the year by getting your bestie an Aeroccino4 Milk Frother so that he can enjoy frothy, milky coffee in the comforts of his own kitchen. The Nespresso Limited-Edition Festive Collection: Variations Paris Macaron, Variations Paris Praliné and Paris Black are available now at $8.80 for 10 capsules online and at Nespresso boutiques. The Nespresso Origin Collection by India Mahdavi will be available in mid-December 2018 and is priced from $35. From now till 2 January 2019, shop selected Nespresso coffee machines at 20% off here.